Nomination Papers: The Council voted to pass Mayor Walsh’s home-rule petition to amend the rules around nomination papers. The home-rule petition would allow registered voters to sign as many candidates’ papers as they wish, rather than limit them to one valid signature for candidates for Mayor and District City Councilor and up to four candidates for City Council At-Large. Councilor Essaibi George opposed the ordinance, citing the large number of candidates that successfully collected enough signatures to make the ballot in 2013 as evidence that the current system is not too burdensome, and stating that having some requirements for potential candidates is a good thing. Liquor Licenses: Councilor Pressley filed a home rule petition to add up to 152 new non-transferable liquor licenses within the City of Boston. The proposal would grant 105 alcohol licenses to seven neighborhoods—Dorchester, East Boston, Hyde Park, Jamaica Plain, Mattapan, Mission Hill, and Roxbury—with each neighborhood receiving five licenses over the next three years. It would also create 15 licenses for Main Streets districts and 30 citywide licenses over the next three years, along with licenses specifically for the Lawn on D and the Boston Center for the Arts. The non-transferable licenses cannot be resold on the open market and must revert back to the City, and the designated neighborhood, if a restaurant goes out of business. Councilor Pressley emphasized the importance of reducing competition between neighborhoods for licenses and reducing the barrier to entry for new restaurants to open in all neighborhoods. The legislation would also create umbrella licenses, which would cover large developments with a single liquor license. Many Councilors rose to express their support and to commend Councilor Pressley for her hard work on this matter. There were a few calls for additional neighborhoods or subneighborhoods to be added in the legislation, which do not have formalized Main Streets programs but do have the potential to benefit from sit-down restaurants. The matter was sent to the Government Operations Committee for a hearing. Needle Disposal: Councilors Essaibi-George, McCarthy, and Baker filed for a hearing to discuss safe and effective needle disposal practices. The opiate crisis has had a disproportionate effect on the City of Boston due to the centralization of recovery services, resulting in an increase in sharps litter affecting every neighborhood in the city. Councilor Essaibi-George cited that Boston 311 has received approximately 3,000 calls flagging needles in city neighborhoods within the past year. Currently, the City has many tools to manage sharps litter, including disposal kiosks and sharps collection teams coordinated by AHOPE and 311. Councilor McCarthy spoke about the need to educate and train students, residents, and city employees in how to handle safe disposal of needles. The matter was sent to the Homeless, Mental Health & Recovery Committee for a hearing. Recruiting & Retaining Educators of Color: Councilor Jackson refiled his hearing order to continue the conversation on strategies for recruiting and retaining educators of color in Boston Public Schools. He noted that as of 2016, BPS students of color represented 86% of the total student population while only 36% of BPS teachers were people of color. Moreover, African American and Asian American teachers leave the district in proportionally higher numbers at earlier points in their careers. Finally, Councilor Jackson noted that BPS has spending $8M-$14M per year for the last few years on new hiring methods to recruit teachers of color, but the overall number of teachers of color has declined in that time due to issues of retaining teachers of color. The matter was assigned to the Education Committee for a hearing. Childcare Assistance to Homeless Families: The Council voted to pass a resolution filed by Councilors Essaibi-George, Pressley, Campbell, and myself in support of S257/HD3564, a bill proposed by Sen. Linda Dorcena-Forry and Rep. Marjorie Decker at the State House, which would provide immediate child care assistance to homeless families. The bill would reinstate a previous policy from 2007 allowing families living in any and all types of homeless shelters to access subsidized full-time childcare for a minimum of 6 months. The need for this type of legislation came out at the first of our Early Education & Childcare Policy Briefings last month, as we heard from families experiencing homelessness about how much of a barrier it was to need to secure childcare while also pursuing job applications, housing search, and education. The public is welcome to attend. The purpose of this meeting is a little different than that of a traditional community meeting. As part of the development review process, IAG members work closely with BPDA staff to identify the impacts of a project and recommend appropriate community benefits to offset those impacts. IAG meetings prioritize discussion between the project proponent (i.e. the developer) and IAG members. If time remains at the end of the meeting, BPDA staff will open the floor to other community members in attendance. Gather a team (no more than 5) of your geekiest co-workers and friends to represent your workplace in Fort Point's very own pub trivia. Questions will range from movies/TV to science to Boston history and more. Sign up your team here. Fort Point's own Craft Beer Cellar will be hosting a beer tasting at 6pm and trivia will stat at 6:30pm. Suggested donation of $10 per team. There will be prizes. The forecast may be calling for snow, but spring is in the air thanks to the return of the Boston Flower & Garden Show at the Seaport World Trade Center. In the spirit of superheroes, you are cordially invited to one of Boston's Best-Kept Secret Parties, The Boston Flower & Garden Show Preview Party benefiting the Genesis Foundation for Children on Tuesday, March 21, 2017 at 6:30 pm at the Seaport World Trade Center. R.S.V. P. today for your exclusive look at The Boston Flower & Garden Show’s beautiful and inspiring gardens and exhibits the night before it opens to the public! The evening will include heavy hors d’oeuvres, beverages, live musical entertainment provided by American Idol Winner Nick Fradiani and Mix 104.1, plus the Mayor is slated to speak. Rub shoulders with other superheroes while lifting the spirits of children with genetic disabilities. More party details on Facebook and at the Genesis Foundation. The Boston Flower & Garden Show runs March 22, 2017 - March 26, 2017. The Seaport World Trade Center is located at 200 Seaport Boulevard. The Genesis Foundation supports innovative clinical care, life enrichment, and educational programs that care for children with complex genetic disorders. On Facebook, Twitter and Instagram. The Friends of Fort Point Channel invites Fort Point businesses to join them at the City Tap House Thursday, March 16th from 8:30 am - 9:30 am for Boston Unplugged, the City's acoustic music entertainment ordinance. City Council President Michelle Wu and Inspectional Services Commissioner Buddy Christopher will make remarks. Bring business cards for networking. City Tap House is located at 10 Boston Wharf Rd. Register for the event. Later that evening from 5:30 pm - 7:30 pm, the Fort Point Arts Community (FPAC) hosts the opening reception of Hearth and Fire, their fourth gallery show of the season juried by Jeffrey De Blois of the Institute for Contemporary Art. 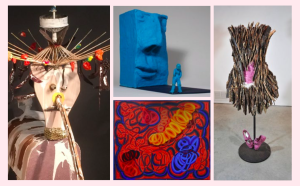 Hearth and Fire features Joe Caruso, Marjorie Kaye, Rachael Shatil, and Tani Shavit who utilize materials to produce sculpture that is informed by prehistory. Show runs through March 31, 2017. The FPAC Gallery is located at 300 Summer St. If all that activity makes you hungry, Dine Out Boston (formerly restaurant week) runs through St. Patrick's Day. Sample area restaurants at special prices featuring a prix fixe menu for lunch and dinner. Each participating restaurant selects ONE of the three price options - the Chef then prepares a menu to delight. Lunch prices are $15/$20/$25 and dinner prices are $28/$33/$38. In Fort Point and Seaport, participating restaurants are: Barlow's Restaurant, Bastille Kitchen (dinner only), Blue Dragon, Del Friscos (lunch only), Menton (lunch only), Morton's, Oak + Rowan, Ocean's Prime (lunch only), Rosa Mexicano, Sapore Restaurant + Bar, Strega Waterfront and Tamo. For a complete list of restaurants visit Dine Out Boston. In Southie the St. Patrick's Day celebration kicks off at 10 am Sunday, March 19th with the St. Patrick's Day Breakfast hosted by Senator Linda Dorcena Forry and televised on NECN. Next grab your running shoes for a fun 5k run benefiting the Edgerley Family South Boston (Boys & Girls) Club's Keystone Teen Leadership Program, keeping teens off the streets and on the right track with your support. The St. Patrick's Day Parade starts at 1:00 PM at the Broadway T Station. View the parade route. Don't forget to wear green. For the ultimate guide to St. Patrick's Day in South Boston visit Caught in Southie. Remember South Boston bars close at 6 pm on Sunday. updated 3/14/17: Snow emergency and parking ban ends at 7 am on Wednesday. If you parked your car at a discounted garage or parking lot, you have until 9 am to remove your car and receive the discounted rate. Boston Public Schools will be closed Wednesday, March 14th. Boston Public Schools will close for the fourth time this winter on Tuesday, March 14, 2017. A snow emergency and parking ban starts at 7 am Tuesday. The purpose of the parking ban is to keep major roadways accessible to plows and emergency vehicles. Cars parked on snow emergency routes will be ticketed and towed. In Fort Point, the following roads are subject to the parking ban: A St., Congress St., Northern Ave., Seaport Blvd. (from Atlantic Ave. to B St.), and Summer Street. Parking at discounted garages starts at 5 am. To receive discounted rates at selected garages you may park up to two hours before a snow emergency and must depart within two hours after a snow emergency is lifted. Check with the garage for rates and details. Closest Fort Point garages are the BCEC parking lot (entrance Cypher St) and the Channel Center Garage. You must show proof of South Boston residency to receive discounted rate. More details at Boston.gov. Stay warm and don't forget to check on your neighbors. The City and State are asking for your input. Today is the public comment deadline on 105 West 1st Street (RCN) re-development site. Although the deadline is today, the project manager said he would still be accepting comments. 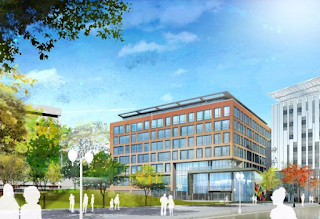 Send your comments to Michael Rooney, Project Manager, Boston Planning & Development Agency. More details. In January, the state presented two Seaport heliport locations on DryDock 4: one at the end of the pier and the other on a barge off of the pier. The public as well as nearby businesses: Blue Hills Bank Pavilion, Legal Seafoods and Yankee Lobster to name a few expressed concerns. To minimize impact on neighborhoods, current helicopter flight paths go over the Boston Harbor, Fort Point Channel and other waterways. An increase in air traffic in close proximity to neighborhoods impacts noise and vibrations, air pollution, public safety concerns, future residents and activation of the watersheet i.e. Fort Point Channel. Although General Electric backed away from the heliport due in part to Logan Airport's close proximity to Fort Point & Seaport, a Boston heliport is still in consideration by the Heliport Working Group, which is composed of State and City officials. Comments will be accepted until end of day Friday, March 17, 2017 and may be sent to heliportboston@dot.state.ma.us and to your elected officials: Senator Linda Dorcena Forry, Representative Nick Collins, City Council President Michelle Wu, Councilor Bill Linehan, and Councilor-At-Large Michael Flaherty. More details and related posts. The next upcoming public comment deadline is March 27, 2017 for Seaport Square. More details. The remaining 13 acres of the 23 acre Seaport Square is being proposed as a 7,680,010 Million square feet of development consisting of 3.2 million residential, 2.8 million of new office, 476,800 square feet of hotel, a cultural and educational center and 1.12 million square feet of multi-level retail, restaurant and entertainment. The BPDA held two community public meetings on Feb 16th and Feb 27th focused primarily on proposed Seaport Square master plan changes to the public realm and open space, and the arts and cultural space leaving many more aspects such as additional millions in square footage (massing) to be addressed at future meetings such as this one. View Seaport Square presentation at March 7th Boston Civic and Design Commission. The 105 West First Street project will comprise an eight story (115' height on W 1st & 103' on W 2nd). The eight story building would rise higher than the Channel Center Garage and the Artist For Humanity Epicenter Expansion. The approximately 266,000 square foot office building contains 1,600+ square feet of ground floor space on West First Street for retail, café or restaurant use and 2,400+ square feet of convener space on West First Street, 10,000+ square feet of innovation space fronting on West Second Street, and 3,000+ square feet of tenant amenity space. The retail/restaurant/café use and innovation space on West First Street and West Second Street respectively are designed to activate the ground floor level of the building. Reprecincting: The Council voted to pass the home rule petition that Councilor Linehan & Council President Wu co-authored to add additional polling locations in the six largest precincts in Boston. The recommendations came out of two public hearings with the Elections Department and community members, pointing out that these largest precincts create significant voter access challenges. In the decades since Boston last made major adjustments to equalize precinct sizes, the city’s population has shifted such that today our biggest precinct (Ward 3, Precinct 8 in Chinatown) has over 6,000 registered voters, while the smallest (Ward 8, Precinct 6 near South Bay) has just under 500 voters. That means very long lines at certain polling locations and difficulty with voter access. For a detailed summary of the first hearing on reprecincting, click here.The home rule petition would allow the City to subdivide these largest precincts in time for the upcoming municipal elections, without changing political district lines or ward lines. The affected precincts are: Ward 3, Precinct 6 (Downtown); Ward 3, Precinct 7 (South End); Ward 3, Precinct 8 (Chinatown); Ward 5, Precinct 1 (Bay Village, Chinatown); Ward 6, Precinct 1 (Seaport, Fort Point, South Boston); Ward 9, Precinct 3 (South End/Lower Roxbury). The changes would need to be approved by the state legislature by June at the latest to implement in time for the September 2017 Preliminary election. If approved, the home rule petition would allow for voter registration locations to be changed in the statewide system. Publishers Note: Ward 6-1 reprecincting subdivides 6-1 and 6-1A at Summer Street in Fort Point. For complete details, view Boston Elections Commission Reprecinting Proposal. Boston Art Commission: The Council voted to pass Mayor Walsh’s home rule petition to give the Institute of Contemporary Art (ICA) one seat on the Boston Art Commission. With this petition, the ICA would join the Museum of Fine Arts, Isabella Stuart Gardener Museum, Boston Public Library, Boston Society of Architects and Mass College of Art in having a seat on the commission. Universal Pre-K: The Council voted to pass Mayor Walsh’s home rule petition to redirect revenue generated in Boston by surcharges on sightseeing tours and rental car transactions from the Boston Convention Center and Exhibition Fund to the City’s general fund to pay for Universal Pre-K for all four year olds in the City of Boston. Currently, the revenue coming in is earmarked toward paying off the Convention Center costs, but often generates a surplus. With the Convention Center expansion on hold, the Mayor is proposing that the revenue generated in Boston come back to the City for this targeted purpose. Boston Fire Department Cadet Program: Councilors Campbell & Linehan filed a hearing order to discuss the feasibility and implementation of a Boston Fire Department cadet training program. In an effort to recruit firefighters who reflect the racial and socioeconomic diversity of the City of Boston, the Boston Fire Department has made recent investments including hiring a Diversity Officer and launching a Teen Academy aimed at providing summer job training for high school students interested in careers as firefighters. The Councilors spoke about modeling the Boston Fire Department cadet program after the recently reinstated Boston Police cadet program, an on-the-job training program for Boston residents ages 18-24 seeking a career in law enforcement. Several Councilors emphasized that this is not a conversation about pitting veterans against communities of color or Boston residents, but should be a data-driven approach about how best to strengthen our law enforcement agencies while creating economic opportunity for the city. The matter was sent to the Public Safety & Criminal Justice Committee for a hearing. Free Petition: City Council President Wu filed an ordinance to codify the right of free petition at the municipal level in Boston. The right of free petition is unique to Massachusetts, found in Article XIX of the state constitution and dating back to colonial times. At the Massachusetts State House, the right of free petition guarantees that any citizen may file a bill through his or her state legislator. Several cities and towns have laws codifying free petition at the municipal level in place already, including Chelsea, Lawrence, Winthrop and Newton. The free petition ordinance would require the Boston City Council to hold a public hearing on the subject of any group petition signed by 250 or more residents, within three months of filing the petition. The goal is to provide another outlet for residents to get involved in influencing policy and public discourse in Boston, regardless of voter registration and immigration status. The proposal received a mixed reaction on the floor: some colleagues spoke about the importance of civic engagement and the need to continually strengthen democracy, but others stated that the Council is already accessible and responsive, expressing concern that this mechanism would give voice to opportunists or strain Councilors’ schedules by pulling time away from constituent services in having to chair required hearings. The matter was sent to the Government Operations Committee for a hearing. All proceeds go to support Save The Harbor free programs and our public beaches. Get to the beach, join in the fun and support a good cause that will benefit you all summer. Update 2.14.17: According to a Boston Globe by Jon Chesto, GE no longer needs a new publicly accessible Boston helipad. View article. 2.6.17: massDot postpones Monday February 6th meeting in order to allow the Heliport Working Group the appropriate time to evaluate and research the comments received on Monday, January 30, from residents, business owners and stakeholders.The Heliport Working Group greatly appreciates the public participation in this process and will continue to work with members of the community to evaluate additional sites suggested at the initial meeting before reconvening at a later date. 2.5.17: View presentation from 1/30th meeting and corrected public comment deadline to 2/17/17. Reminder: Final public meeting is Monday, February 6th (details below). All are encouraged to attend. The Massachusetts Department of Transportation (massDOT) will host two public meetings seeking community input on a proposal to build a Heliport on the waterfront in Boston’s Seaport District. Officials from massDOT will present important discussion topics such as possible locations, air routes, and temporary and permanent design concepts. heliportboston@dot.state.ma.us and to your elected officials: Senator Linda Dorcena Forry, Representative Nick Collins, City Council President Michelle Wu, Councilor Bill Linehan, and Councilor-At-Large Michael Flaherty. Public comment period closes March 17, 2017. For questions, comments or issues, please email Jim Kersten, MassDOT Legislative Liaison or contact him by phone at 857-368-904.